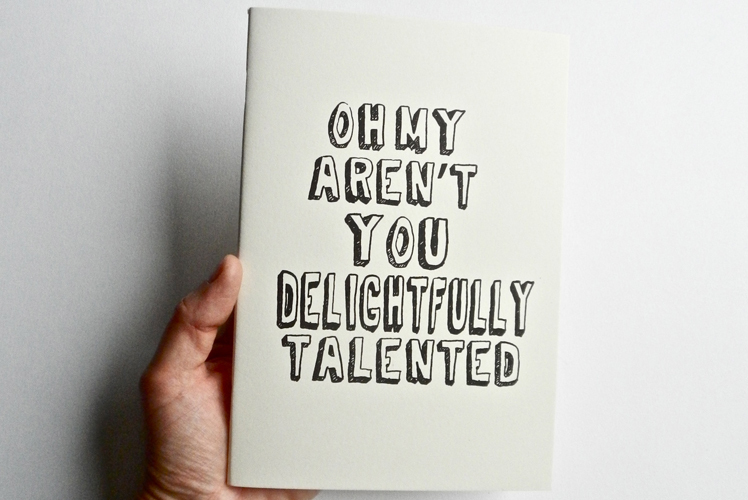 FK chats to Jo Olive one half of talented husband and wife label, Olive and the Volcano Letterpress. Look out for OVL at the upcoming Brisbane Markets! 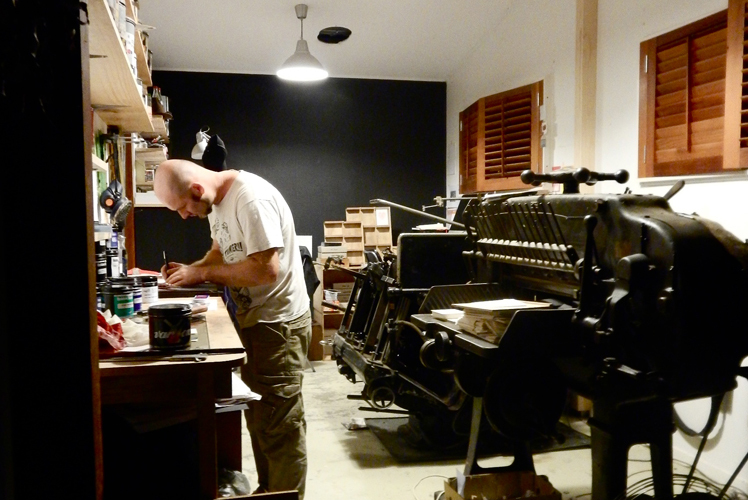 Tell us a bit about Olive and the Volcano Letterpress and what we can expect to discover? Our letterpress studio is set amongst the daily routines of raising three little people and our wish to live simply and creatively. 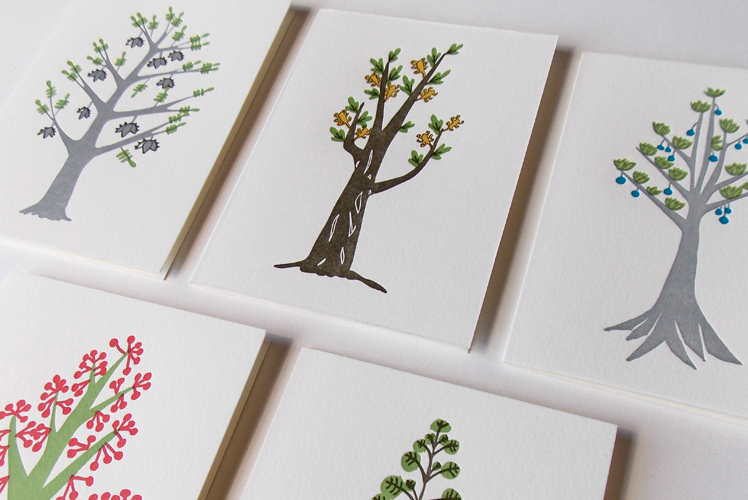 In our Northern Rivers studio we produce handcrafted letterpress paper good such as notecards, notebooks, gift tags, coasters and custom letterpress projects such as business cards and prints. We tend to design from a place of positivity and we are equally inspired by humour, the written word, the natural world and the business of making marks by hand. Both of our backgrounds are varied and diverse but it has always been our training and interest in print, design, fine art, graphics and illustration that has propelled us forward and informed our creative practices (even when we were not in creative occupations!). Andy trained in Industrial Design and Graphic Arts while I trained in Fine Art History, Printmaking and Arts Education. We have both dabbled in other fields but have come full circle, back to our initial loves. Once we started a family and time became very precious, we decided that life was way too short and it was necessary for us to teach our children the importance of living the life you want to live. Our studio became our full-time focus from February this year. What do you love about working with Letterpress? and what keeps you creatively motivated? We love every aspect of our craft. We love the velvety ink, the cloud-like papers, we love the history, the tools, the type, the process, the tactile impress of the print and of course we love our press! 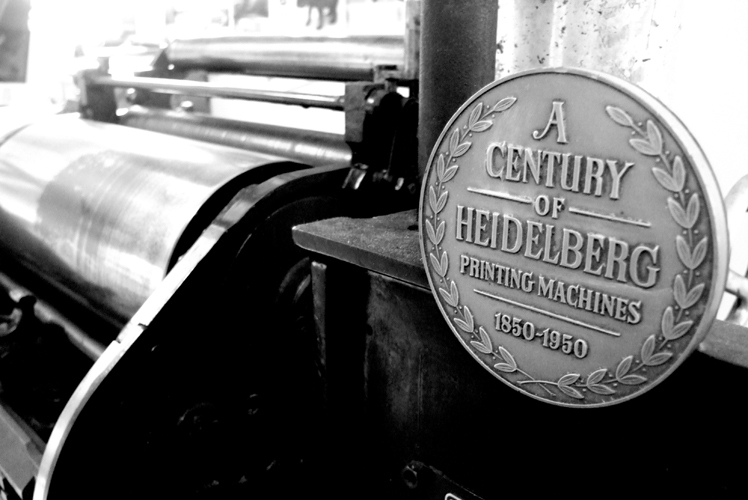 We use a Heidelberg Windmill Platen Press (Black Ball) that is dated around 1956-57. We haven’t met anyone yet who doesn’t fall instantly in love when they hear that beautiful whooshing sound! 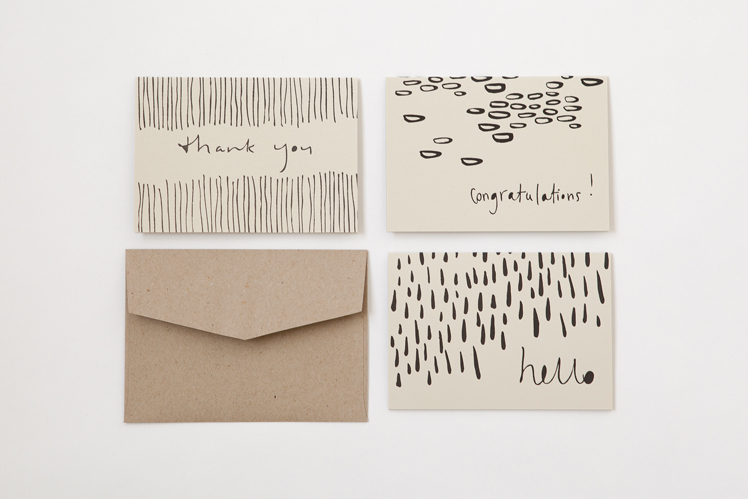 We love that letterpress allows us to handcraft objects of beauty and purpose. 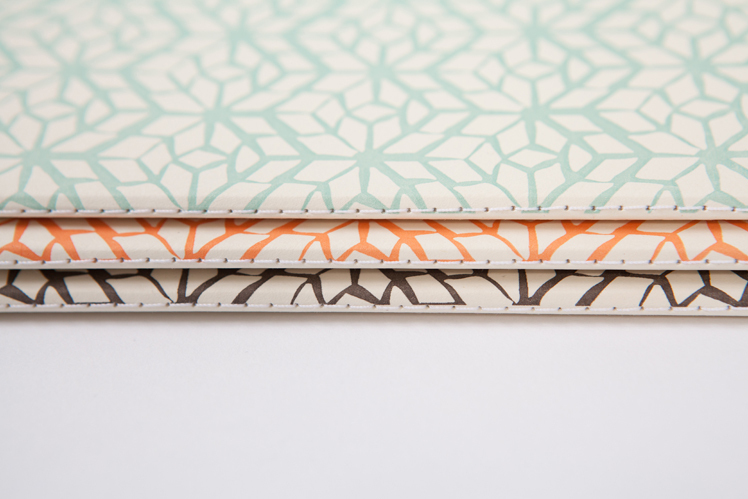 Everything is done in house and by hand, we design, print, stitch, trim, score and fold each item that we create. Letterpress is defined by constant learning and it is this want to produce a “better” product, a “finer” print, a more “elegant” design, a “cleaner” layout that motivates us daily. What is your creative workspace like and what inspires you about your surroundings? Our creative workspace is tiny! It is literally a part of our house and we can see the press from our kitchen table. Our little black studio is quite minimal with just the necessary tools and materials on show. I tend to keep my surrounds visually “quiet” so that I’m not distracted by too much colour or visual “noise”. I tend to work more effectively outside and then come inside to transfer yy marks and ideas into digital designs. Andy’s space in the studio is similar but he prefers to work into the night, drawing and sketching before spending much time crafting his work digitally. 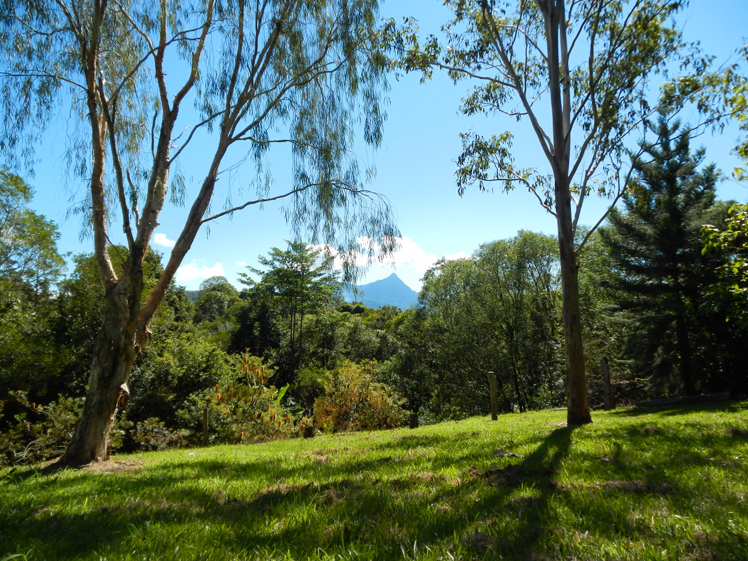 Our studio looks out onto Mt Warning and the lush green countryside of the Northern Rivers. We are always in the middle of nature’s majesty and it is a constant source of inspiration. Starting our own studio took a number of big leaps and shifts. Working so closely together has luckily been a joy rather than a distraction, and we have learnt to be very flexible, hand-balling jobs and duties to each other when needed. We’re getting better at “turning-off” and ensuring that we have a balanced life with enough time for our own individual needs and time with the kids. It’s very easy to become all consumed in your work! We love that we are our own bosses and that we have immense freedom to choose when and what we do for the day. We also love the satisfaction that comes from creating a business and lifestyle that works for our family and that allows us to live the life we have always wanted. Being a new studio, there will always be challenges whether they be management, defining roles or financial, but we are lucky that our creative community is rich with support and knowledge and there is always someone with the necessary skills that we can ask for advice! Our next year is set to be huge. Andy has plans to launch an additional letterpress label, allowing him to focus on a more urban style of design and OATV will be my baby, in which I get to dive into my printmaking past to refine my own design voice. In terms of the studio, I see OATV as having a bigger purpose. One of the main reasons we create what we do is that we understand the importance of putting pen to paper. We make notebooks and notecards because we see the act of writing as being integral to our happiness and well being. By spending 5 minutes each day writing without judgement you can transform your mood and clarify your perspective, and by sending handwritten notecards you connect intimately with the people in your world, you build stronger bonds. It’s part of my goal for the studio to develop meaningful relationships with organisations that promote positive change through writing whether it is literacy or writing to improve mental health. It’s my hope that our positive outlook, our products and our purpose can come together to achieve great things. That would make me smile.